The illustrator Edward Ardizzone (1900-1979) is best remembered for his ‘Tim’ series of children’s books and his drawings for the Penguin edition of Stig of the Dump. He drew a certain kind of Englishness, a comforting world of absorbed lovers, afternoon drinkers and naughty schoolboys (see Eye 85). His small-scale dramas featured everyday people with rotund bodies and receding hairlines. Ardizzone’s commissions included illustrations for the Radio Times and Punch magazine and murals on the liner Canberra. 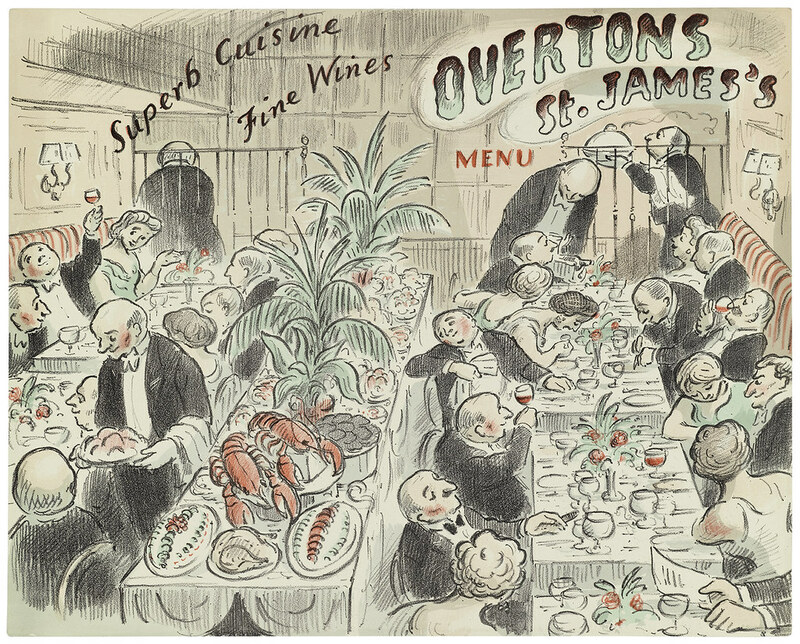 In the 1950s he drew these three menu covers for the two branches of Overtons restaurant in Victoria and St James’s, London and their associated restaurant Hatchetts in Piccadilly. When folded, Ardizzone’s drawing made the front and back covers, while the inside pages were overprinted with the menu. Ardizzone’s image for the Victoria branch was drawn direct onto the litho stone at the Curwen Press in 1956, later transferred to litho plates and continued to be used in various adaptations until the 1990s when the restaurant closed. Curwen also typeset and printed the menu on the reverse by letterpress using their famous range of display fonts and ornamental borders. 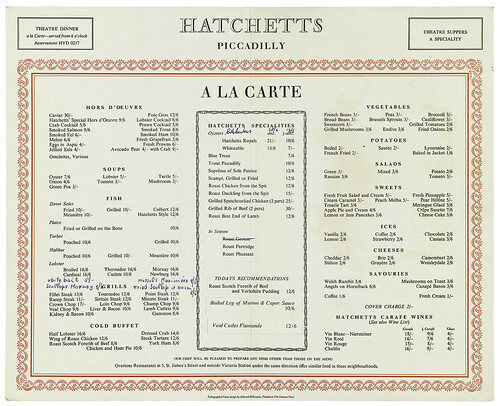 The back and front covers of the menu illustration for Hatchetts in Piccadilly. Only the lobsters seem unhappy. 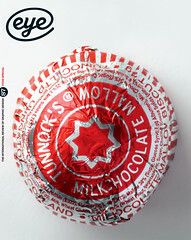 Top: cover of the Overton’s St James’s menu. Ardizzone evokes the bustle of the restaurant with its red-cheeked guests in conversation or enjoying their wine and after-dinner cigars.